Only one (maybe more) may win! 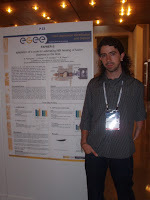 Manuel will explain you how they took a Fusion Physics application called FAFNER2, which simulates particle trajectories inside the reactor using a proprietary MPI library in a 64 bits MIPS SGI cluster, and ported it to different architectures. These architectures were a x86 32 bits cluster and of course, the Grid (using the GridWay Metascheduler). 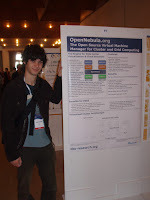 Javier will show you the results of our Research Group latest Research line: OpenNebula, which transforms a physical infrastructure into a virtual infrastructure by dynamically overlaying VMs over physical resources. The poster will be complemented by a live demo, just ask Javier for that! 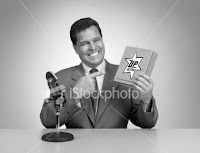 Best of luck to everyone! May the best poster win!